Simultaneous non traumatic bilateral femoral neck fractures are very rare presentation in adult with normal bone structure but it can occur in patients with renal osteodystrophy due to abnormal bone morphology. So primary care physician should be aware and alert for this condition to avoid delay in diagnosis and treatment..
Case Report | Volume 5 | Issue 4 | JOCR Oct-Dec 2015 | Page 24-26 | Sathyanarayana V, Maulik Tulsibhai Patel, Raghavan S, Naresh D. DOI: 10.13107/jocr.2250-0685.337 . Introduction: Pathological bilateral femoral neck fracture due to renal osteodystrophy is rare. This is a report of a chronic renal failure patient who had sustained bilateral intra-capsular displaced fracture neck of femur following an episode of convulsion and the difficulties encountered in early diagnosis and treatment. The pathophysiology of renal osteodystrophy and the treatment of hip fractures in patients with renal failure are also discussed. Case Report: A 23 years old male patient admitted with h/o dysuria, pyuria and loss of appetite since 3 months. He was a known case of chronic renal failure and reflux nephropathy. On investigating, patient’s renal parameters were high and he was started with haemodialysis. The next day patient had c/o bilateral hip pain and inability to move bilateral lower limbs following an episode of seizure. Radiograph of pelvis showed vertical sub capital fractures of bilateral neck of femur. In this patient, considering his age, general condition & prognosis, an elective surgery in the form of bilateral uncemented modular bipolar hemiarthroplasty was done. Conclusion: Overall risk of hip fracture among patients with chronic renal failure is considerably higher than in the general population, independent of age and gender. Simultaneous spontaneous bilateral fractures of the femoral neck are rare and a delayed diagnosis is usual. The study of etiological factors of these fractures is essential to guide us in choosing the treatment of choice. Obviously patient’s age, life expectancy as well as renal co morbidity has an influence over deciding treatment and outcome. 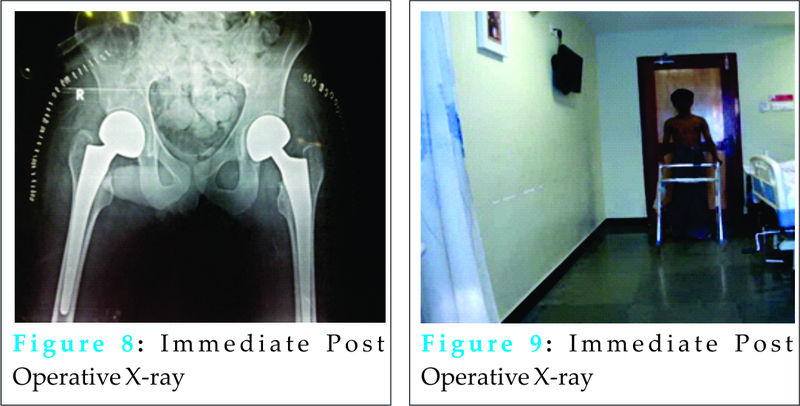 Keywords: Renal osteodystrophy, subcapital femoral neck fracture, bipolar hemiarthroplasty. Possible causes for femoral neck fractures in renal failure patient are identified as trivial trauma , abnormal anatomy , seizures [1, 3, and 4] and osteoporosis [5, 6]. Renal osteodystrophy encompasses a number of skeletal abnormalities, including osteitis fibrosa, osteomalacia, hyperosteidosis, osteosclerosis and several types of developmental problems in children . With this abnormality in bone, pathological fractures are common but bilateral simultaneous displaced femoral neck fractures are very rare .That’s why we are reporting this case of a young adult with chronic renal failure with bilateral simultaneous displaced femoral neck fractures due to renal osteodystrophy. The pathophysiology of renal osteodystrophy and the treatment of hip fractures in patients with renal failure will to be discussed here. A 23 years old male patient admitted with h/o dysuria, pyuria and loss of appetite since 3months. He was a known case of chronic renal failure and reflux nephropathy. On investigating, patient’s renal parameters were found to be very high. His serum creatinine was 8.9 and blood urea was 175. So, he was started on haemodialysis. The next day, patient complained of inability to move bilateral lower limbs following an episode of seizure. Neurological opinion was opted to rule out the cause of seizure. 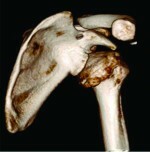 Orthopedic opinion was not considered as the patient did not sustain any trauma. All possible investigations were performed to know the cause of seizure. His calcium was 4mg/dl. Hypocalcaemia was the cause for his seizure. Patient was treated for hypocalcaemia. Next day, patient continuously complained of bilateral hip discomfort, therefore orthopedic evaluation was carried out and a radiograph of pelvis was taken which showed vertical subcapital displaced fractures of bilateral neck of femur (figure 1).Working on this patient, he had hypocalcaemia, hyperphosphatemia (6.2 mg/dl), increase ALP (alkaline phosphate) and hyperparathyroidism (488 pg/ml). From these parameters diagnosis of, pathological bilateral neck of femur fracture with hyperparathyroidism due to renal osteodystrophy was made. 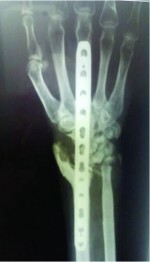 In this patient, considering age, general condition & prognosis an elective surgery bilateral uncemented modular bipolar hemiarthroplasty was performed (Figure 2 to 7- intra operative and figure 8 – post operative X- ray). Reasons for choosing this surgery were (1) 3 days old fracture due to delay in diagnosis (2) bilateral subcapital vertical displaced fracture with high chance of vascular compromise causing avascular necrosis (3) poor prognosis for internal fixation as patient had osteoporosis secondary to renal osteodystrophy (4) patient was planned for elective renal transplantation within next 3 months and after that patient might require higher dose of steroids and other immunosuppressant which further increases the chance of avascular necrosis and failure of internal fixation. Post-operative period was uneventful. Patient was mobilized on 5th day post op (figure 8) and was discharge on 11thday after suture removal with vit-D3 & calcium supplements and weekly twice dialysis. In adults, with normal bone structure, bilateral femoral neck fracture is a rare condition, as it requires significant external force like motor vehicle accidents or a fall from a height [9,10]. On the other hand minor trauma may cause the fracture when the bone has structural or metabolic changes as in osteomalacia and osteoporosis [11,12]. Seizures in epileptic patients or convulsions secondary to metabolic problem like renal osteodystrophy are recognized as unnoticed kinds of trauma. Seizure associated trauma was reported to occur in the shoulder region causing posterior dislocation, in the spine causing compression fractures of the vertebrae and in the pelvis causing hip dislocation and femoral neck fracture; its incidence was estimated to be around 0.3% . The mechanism by which renal osteodystrophy occurs in patients with glomerular failure is as follows. It begins with failure of filtration, which results in phosphate retention. Hyperphosphatemia plays a key role in renal osteodystrophy . Because of decrease in filtration and increase in phosphate level, there is decrease in 1, 25 dihydroxy vitamin D synthesis. Which leads to decrease calcium absorption from gastro intestinal tract and kidneys and hence there is profound reduction in serum calcium level . Low calcium level stimulates parathyroid to produce more parathyroid hormone (PTH). PTH increases bone resorption to maintain serum calcium level. So the body maintains blood calcium level at the expense of bone. This leads to highly osteoporotic bones . Severe nutritional osteoporosis may develop in some of the patients who are very ill and not able to take balanced diet and under nourished . In our patient who is very young, chronic renal failurewas the only cause of osteoporosis and hypocalcaemic seizures owing to simultaneous bilateral femoral neck fractures. The mortality rate of hip fracture with renal failure is very high . The one-year mortality rate from the hip fracture in patients on dialysis was found to be nearly two and a half times higher compared with the general population . In the treatment of hip fractures in patients with renal failure, recent reports favoured operative treatment. Schaab et al reported that operative management was found to be superior to conservative treatment as far as complications and mortality rates were concerned . Klein et al stated that operative treatment and aggressive mobilisation allow patients with renal failure to regain ambulation and return to the level of independence they had before their hip fracture . Renal osteodystrophy is usually a diagnosis of end stage renal disease. However, it can be brought in to a high suspicion in a patient with chronic renal failure with muscle pain and localised groin discomfort in spite of not having history of significant trauma as in this case. It is therefore important to evaluate the severity of renal osteodystrophy and to take therapeutic measures such as the control of phosphorus by phosphate binders and the use of vitamin D analogs to suppress hyperparathyroidism, regular dialysis and calcium supplements. All these measures are very important for prevention of severe osteoporosis in chronic renal failure patient. Multispecialty approach which combines both nephrologists and orthopaedician is required for good outcome of the patient. Patients with fractures and renal failure have high complication rates . It is suggested that stabilization of the patient before surgery and after surgery is very important. Careful team approach of both nephrologists and orthopedic surgeon is needed to reduce complications and mortality in such critically ill patients. Our aim for presenting this case is to create awareness among young orthopedic surgeons that thorough examination and detailed investigation is necessary in a patient with chronic renal failure even if they did not sustain any significant trauma because they do not present clinically as a typical fracture case and delay in diagnosis is usual. 1. Günal I, Gürsoy Y, Araç S. Traumatic bilateral fractures of the femoral neck (a case report). Hacettepe J Orthop Surg 1991;1;4. 2. Annan IH, Buxton RA. Bilateral stress fractures of the femoral neck associated with abnormal anatomy: A case report. Injury 1986 ; 17:164-166. 3. Madhok R, Rand JA. Ten-year follow-up study of missed, simultaneous, bilateral femoral neck fractures, treated by bipolar arthroplasties in a patient with chronic renal failure. Clin Orthop 1993;291:185-187. 4. Taylor LJ, Grant SC. Bilateral fractures of the femoral neck during a hypocalcaemic convulsion: a case report. J Bone Joint Surg 1985;42-B: 536-537. 5. Gerster JC, Charhon SA, Jaeger P, Boyvyn G, Briancon D, Rostan Aet al. Bilateral fractures of the femoral neck in patients with moderate renal failure receiving fluoride for spinal osteoporosis. Brit Med J 1983;287:723-725. 6. Köse N, Özçelik A, Günal I, Seber S. Spontaneous bilateral hip fractures in a patient with steroid-induced osteoporosis : A case report. Acta Orthop Scand 1998;69:195-196. 7. Crutchlow WP, David DS. Skeletal complications of kidney disease. Clin Orthop 1971;74:209-220. 8. Ogun TC, Memik R, Yel M, Sarlak A. Bilateral pathologic femoral neck fracture as a consequence of ranalosteodystrophy: Report of two cases and review of the literature. 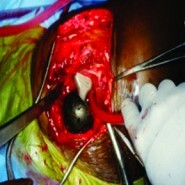 J Arthroplasty Arthroscopy Surg.2001;12:199–202. 9. 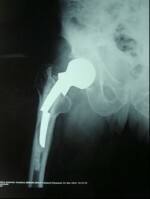 Speed K. Simultaneous Bilateral Traumatic Dislocation of the Hip. Am J Surg 1953; 85:292-295. 10. Shroder J, Marti RK. Simultaneous bilateral femoral neck fractures; case report. Swiss Surg. 2001;7:222-224. 11. Chadha M, Balain B, Maini L, Dhal A. Spontaneous bilateral displaced femoral neck fractures in nutritional osteomalacia. A case report. Acta Orthop Scand2001;72(6):94-97. 12. Karapinar H, Ozdemir M, .Akyol S, Ukiku O. Spontaneous bilateral femoral neck fractures in a young adult with chronic renal failure. Acta Orthopaedica Belgica. 2003;69: 82-85. 13. Finelli, P. Cardi J. Seizure as a cause of fracture. Neurology 1989;39:858-860. 14. Cushner HM, Adams ND. Review: renal osteodystrophy-pathogenesis and treatment. Am J Med Sci 1986;291:264-275. 15. Mankin HJ. Metabolic bone disease (Instructional course lecture). J Bone Joint Surg 1994;76-A:760-788. 16. Mankin HJ. Rickets, osteomalacia and renal osteodystrophy (Review article, part 1). J Bone Joint Surg 1974;56-A:101-128. 17. Klein DM, Tornetta P, Barbera C, Neuman D. Operative treatment of hip fractures in patients with renal failure. Clin Orthop Relat Res. 1998;350:174–8. 18. Klein D M, Tornetta P, Barbera C, Neuman D. Operative treatment of hip fractures in patients with renal failure. Clin Orthop 1998;350:174-178. 19. Coco M, Rush H. Increased incidence of hip fractures in dialysis patients with low serum parathyroid hormone. Am J Kidney Dis 2000;36:1115-1121. 20. Schaab PC, Murphy G, Tzamaloukos AH et al. Femoral neck fractures in patients receiving long-term dialysis. Clin Orthop 1990; 260:224-231. October 1, 2015 Neglected Anterior Dislocation of Shoulder: is surgery necessary? A Rare Case with review of literature.